My fiance and I have been in a long distance relationship for 7 and a half years now. He lives in Essex, I live in Somerset which is about a 3-hour drive away. I realise that may not seem like a big distance for some, but we still struggle with the typical long distance relationship problems. However, if everything works out the way we’re hoping, we should be living together later this year. I can spread out as much I want. I can take all the duvet without hearing a single complaint. But best of all, I don’t have to put up with any annoying snoring! Honestly, when we move in I’m going to really struggle having to share a bed every single night. How do people do it?! We both have very different interests and hobbies which our relationship doesn’t get in the way of. I feel like I’d struggle to find the time to blog if he was always around and he probably wouldn’t go to the gym as much. We’re able to focus on our careers, other relationships and hobbies, which I feel is more difficult to do when you’re around and, understandably, consumed by each other all time. Usually, we only see each other on a weekend so we really make the most of every second. We don’t waste time deciding where to eat or what to do, we make plans. Not only does it gives us both something to look forward to, but it’s a way to always try something different, go to new places and experience things we wouldn’t have normally experienced. Made in Chelsea, Love Island, RuPaul’s Drag Race, I can watch whatever I want without having to consider what he’d like to watch. I can spend my evening’s binge-watching Gilmore Girls while he watches Marvel movies and we’ll still be talking through text. Again, like with the bed sharing, sharing the TV is something I’m also worried about when we move in haha. Being in a long distance relationship for so long proves to both of us that we are truly dedicated to each other and the relationship. We’ve both had opportunities to go our separate ways and date other people that live close by but neither of us ever wanted that despite how much easier it would be. It’s difficult and not an ideal situation but we’ve found a way to make it work and we’re happy. We’ve had some very big issues when it comes to trust and jealousy. More so in the beginning of our relationship than now. When you haven’t seen each other for a while and they go on a drunken night out, or there’s a girl flirting with him in the office, or other people try to get involved telling you it won’t work and when you realise you’ve seen/spent more time with co-workers than each other, jealousy definitely rears its ugly head. We’ve had countless arguments over the years due to jealousy and it’s taken a very long time to build trust. There’s no one way to do it, it’s just taken time, dedication and communication. We’re both in a comfortable place right now, but that doesn’t mean we still don’t worry or argue about trust. (Please excuse the terrible quality of this picture. Neither of us are very comfortable in front of the camera so the only pictures we have together are on drunken nights out haha). By only communicating just through text or quick phone call things can get misconstrued and lead to an argument. Through text, you can’t hear someone’s tone of voice or see their facial expression, making it very difficult to decipher how they’re feeling. While emojis can really help to get your feelings across it doesn’t always work. If one of you are in a rush and only have time to type out a quick message it can come across as being cold or blunt to the other person, who is then left wondering what went wrong. It sounds silly but we’ve had many fights over a small miscommunication. When you can only spend weekends together certain things will pop up such as birthdays, appointments, friends and family get-togethers etc, that’ll keep you from seeing each other. Before you know it weeks or sometimes even months have gone by and you haven’t seen each other. For us, March is a particularly tricky time. As he works in finance it’s an extremely busy time of year workwise so he can’t take any time off, my mum’s birthday is one week, his dad’s birthday the next week and then Mother’s Day the week after. It takes a lot of effort, planning and organisation to ensure we actually get to see each other too. This is probably the most difficult thing for me personally. If you’ve been around for a while you’ll know how much I treasure holidays like Halloween and Christmas. In the 7 years we’ve been together we’ve never spent Christmas or Halloween together, which is really hard for me. We’ve also never been together on Valentine’s Day either. I want more than anything to spend the whole Christmas season together from choosing a tree and decorating to watching movies and Christmas shopping. Spending all the holidays together is what I look forward to the most when we move in. Again this is something both of us struggle with most. We’ve never properly cooked together, gone food shopping, binged watched a show together, spent an entire Sunday in our PJs eating snacks or other regular things couples do. Seeing people moan on Twitter about silly things such as their other half leaving cupboard doors open, being untidy or stealing the last biscuit makes me feel oddly jealous as we don’t get to go about our day to day lives with each other. However, it’s those small, insignificant things that we really look forward to experiencing when we’re living together. I hope you all enjoyed this post. 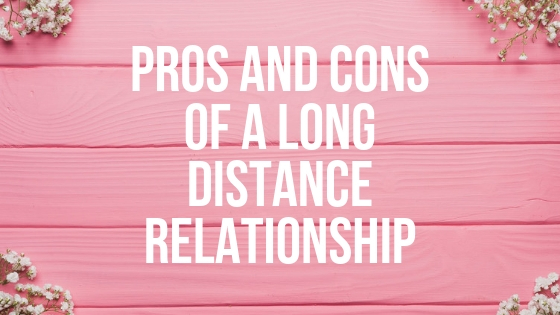 Let me know in the comments if you’ve ever been in a long distance relationship and what your pros and cons are! Don’t forget to subscribe to my blog while you’re here and follow me on Instagram, Pinterest, and Twitter too. Thanks for reading! All points are so right!